VALUES OF U.S. COMPANIES IS SKYROCKETING! The value of American companies are worth $5.2 TRILLION more than when Trump took office.That is serious growth and wealth creation! •Consumers can't be the only engines of growth--they now have the help of business spending. •I don’t believe going into debt is a good thing—but what this number tells us is that there is optimism for the future and businesses are now in expansion mode for the first time in a long time. Consumer spending is up 2.8%. This is less than what economists would like to see to get this economy on track, which is 3%. The Dow Jones Industrial Average (DJIA) is up over 7,000 points since November, 2016. TRUMP WANTS TO MAKE AMERICA GREAT AGAIN! This is starting to happen!The trade deficit fell to $43.6 BILLION. It’s still negative, but it is starting to shrink as Trump is bringing jobs back to America, instituting a weak dollar policy (which I have another video explaining, but in a nutshell it makes American exports cheaper around the world). One by one, religious freedoms that have been stolen over the years are starting to come back.SO GOOD THINGS ARE HAPPENING UNDER THE TRUMP PRESIDENCY! That is a far cry from what you will hear on the news. Not all is sunshine, rainbows and lollipops though. There is something looming on the horizon politically, geo-politically, and economically. 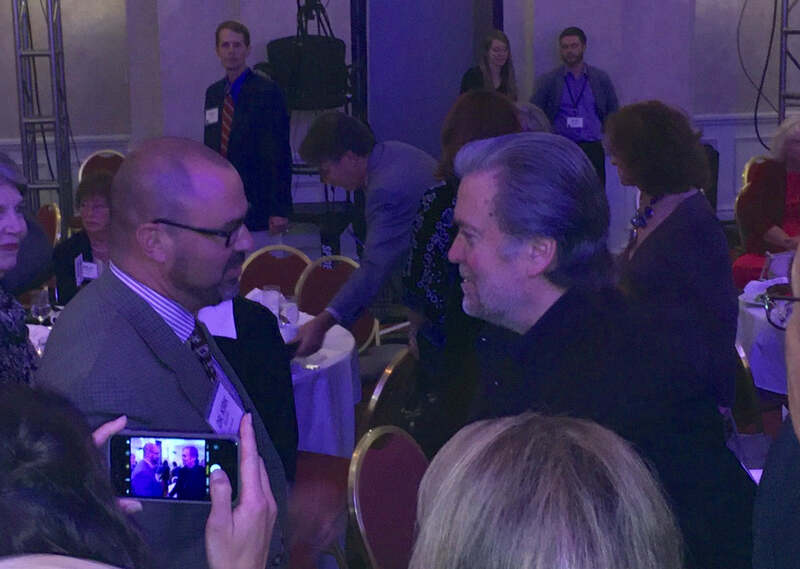 I was recently in a meeting with Steve Bannon. What he said was alarming, and I will share some of it with you here. •China is making a play to control the economic world. History has shown us that whoever controls central Asia controls the world. •China is building an impressive infrastructure across central Asia. It’s the new silk road. •The $20 trillion U.S. national debt is nothing compared to the multiple QUADRILLION of global derivatives. •This is a very fragile house of cards, and when the derivatives bubble bursts the house of cards will be a financial disaster that the global economy may not recover from. •For thousands of years respect for the rule of law has been eroding. •Governments come and go over that time. America is on the edge of the cliff with one foot hanging off! •We have POLITICAL UPHEAVAL, CLASS WARFARE, ECONOMIC WARFARE, A DEBT BUBBLE that’s about to burst, and WARS AND RUMORS OF WARS globally. THIS IS WHY STEVE BANNON IS SO FIRED UP! Why is Bannon going after Mitch McConnell and other politicians from his own party? Because they are not acting with a sense of urgency. I agree. With America on the brink of economic ruin and the fabric of our society being eroded from the inside out, NOT ACTING WITH A SENSE OF URGENCY is practically unforgivable. So, he wants to do what he can do to ensure that those politicians are replaced with ones that have a sense of urgency. AMERICA IS ON THE BRINK OF DISASTER. North Korea now has a nuclear device on a Satellite that passes over the United States. This according to a statement by James Woolsey, former director of the CIA. How likely is it that the Kim regime has developed a functional ICBM and a miniaturized warhead? Probably not fully yet. But it doesn’t matter because they don’t need an intercontinental ballistic missile (ICBM) in order to attack directly the United States. They can do so with a satellite launch and [they] have nuclear weapons contained in the satellite that continues to circle the Earth a couple of times a day. ... So it does not take an intercontinental ballistic missile to reach the United States. You can do it fine with a weapon on a satellite. WHAT DOES ALL OF THIS MEAN FOR YOUR INVESTMENTS? WHAT IS POISED FOR LARGE GAINS? Precious Metals (gold and silver) thrive under chaos, uncertainty, turmoil and change. WHAT IS POISED FOR LARGE LOSSES? Bonds. Janet Yellen, Chairwoman of the Federal Reserve announced we have another rate increase scheduled for December, and four or five more in each of the next two years! Rising interest rates means bonds come down. Stock Market. Not Now, But Ultimately the Stock market. At an all time high, the stock market is in for a time of loss as people crippled with debt will get pinched even more as interest rates rise and REDUCE THEIR SPENDING. We need to act. We need to help ensure that PEOPLE OF ACTION are elected to office as we are living in a time of urgency.Act with urgency by loving your neighbors and making a difference in people’s lives.We need to act with urgency in our financial portfolios. We need a sense of urgency to protect and preserve everything we have worked our entire lives to accumulate. It’s not too late to act. In fact, the time is perfect! With stock and bond markets at very high levels, we need to buy low and sell high.We have a gift right now. An open window to act and take advantage of the trends so the trends don’t take advantage of us.